If you are planning to build a new home, there are many things that you may want to add to make it a beautiful, comfortable space for you and your family to live in. For many people, the list of must-haves in a home includes a grill. After all, what better way to spend long, lazy summer evenings than to have a family barbecue right at home or an impromptu get together with friends that includes steak and burgers, cooked on your very own grill. The thing is that, if you have always dreamed of having one of those homes with the outdoor grills that are "built in", then you need to plan ahead. Figure out where you need the grill installed, how it'll work with the rest of your kitchen, or if you are having it on your patio, how well it is oriented for you to be able to cook with ease and convenience. There are also many regulations and laws to follow with both outdoor grills and grills for apartment complexes and there is no question of violating these because they are designed for your safety. You do NOT want to increase the risk of a fire hazards in your home or outdoor areas. Before you start shopping for stylish, snazzy grills with all the features and functionalities that you can get, there is one decision that you need to make first. 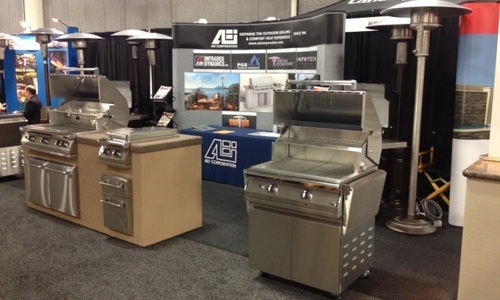 Are you only considering permanently installed grills or would you also be considering portable grills? There are advantages to both and knowing them helps you make a smart decision on what to get. Keep in mind that this could be a big decision for you that can impact your home’s comforts and value, especially if you do intend to use the grill really often so invest some time and attention in figuring which one suits you best, right now. Okay, so you have decided that you want a grill in your outdoor area, maybe on the patio or in the little backyard enclave off your garden. Great idea! This way you can have a few people over for a party and enjoy your grilled food while you have fun. The outdoor location enables you to barbecue without worrying about setting off smoke alarms or being too nit- picky about spillage. You can keep the kids safely away from the grill because there is space for them to run around. Portable grills are far more compact and that’s a big advantage if your home is small and there is not much space to spare. You can practically set a portable grill up in one corner of the kitchen and use it without any hassle at all. With an installed grill you are pretty much tied down to one location of your house when you want to grill some hot dogs or patties. Portable grills give you far more flexibility than a built in grill. Most portable grills do not come with any safety mechanisms to keep your counters or surroundings safe from the effects of excessive heat. You have to make sure that the grills are not touching any flammable surface, and they are not too near items or surfaces that may warp under heat. With permanently installed grills, these aspects are taken into consideration at installation time. You don’t need to worry about safety and fire hazards every time you are using the grill except for making sure that nothing is left on top of the grill or too near it. If you are the type of person who loves to picnic outdoors, then a portable grill may be perfect for you. You can simply pack it up and carry it along wherever you want to go, and you have the means to barbecue your food at any time. Some portable grills are so compact that they fit into a fair sized backpack. You can simply pack it into one and carry it over your shoulders on trekking trip or a family vacation. With an installed grill, you do not have the option of grilling your food anywhere but at the ready-made station and that means, if you want to grill stuff when you are outdoors, you will have to get a small, portable one anyway. The installed grill has a big advantage over the portable one in terms of size. If you have a large family or you like entertaining a number of friends, then it can be a real pain to grill food over a small portable one. It could take ages and by the time the food is done for everyone, the party may well be over. With a built in grill, you get to finish off the cooking faster by grilling more food at one go so that you are free to mingle with the guests and enjoy the party like everyone else. If you choose a small portable grill, you could bet stuck cooking for everyone all the time while everyone else is having fun at your party. The thing is to keep your needs and usage patterns in mind before you decide on whether the permanently installed grill or the portable one will suit your needs best. Invest some thought into this and consider all the advantages of either type mentioned above before you go out and buy a grill for your home. This is a good way to ensure that you are making a judicious decision whether you are looking for grills for apartment complexes or outdoor grills that will give you the hours of enjoyment and authentic flavor of grilled food that you desire.